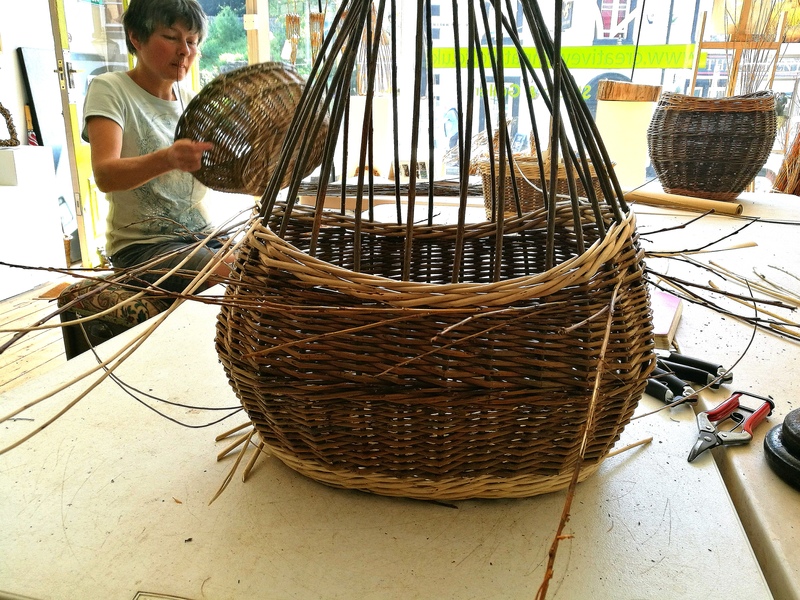 CWN is very happy to welcome experienced Scottish weaver Fiona MacDougal once again to Todmorden to teach this intermediate basketry course. A step on from a round basket, this is for people how have made a few baskets and want to progress on. You’ll work on a traditional English base and work with at least 4 basketry weaves to complete this fabulous looking basket. These sturdy and pretty plant/pea climbers look great in the garden, are suitable for pots as well as in the ground and plants love them. Over the day there will be enough time to weave 2 climbers and a dragonfly for the top. 3 Places Left!! These small Bread Baskets can have multiple uses and look great on any kitchen table. Ideal for beginners and those new to basketry, over the day you’ll learn basic basketry techniques to create a sturdy, useful basket. These small Bread Baskets can have multiple uses and look great on any kitchen table. 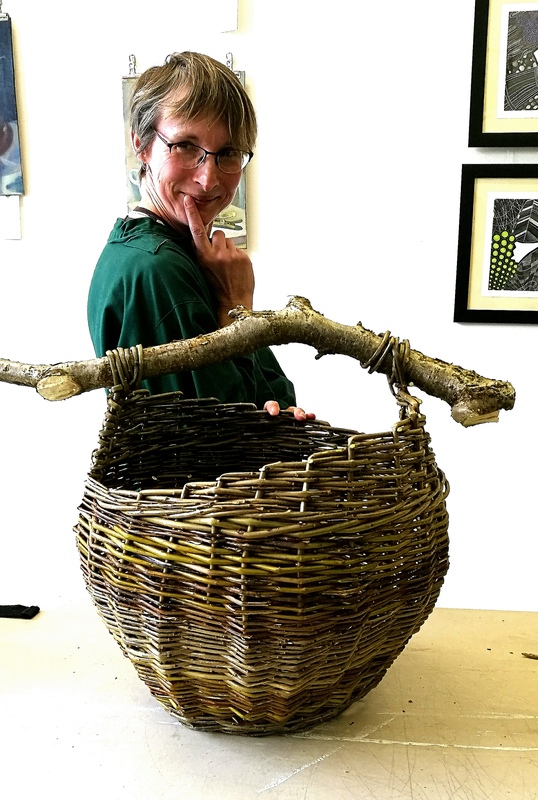 Ideal for beginners and those new to basketry, over the day you’ll learn basic basketry techniques to create a sturdy, useful basket.2 places left!! 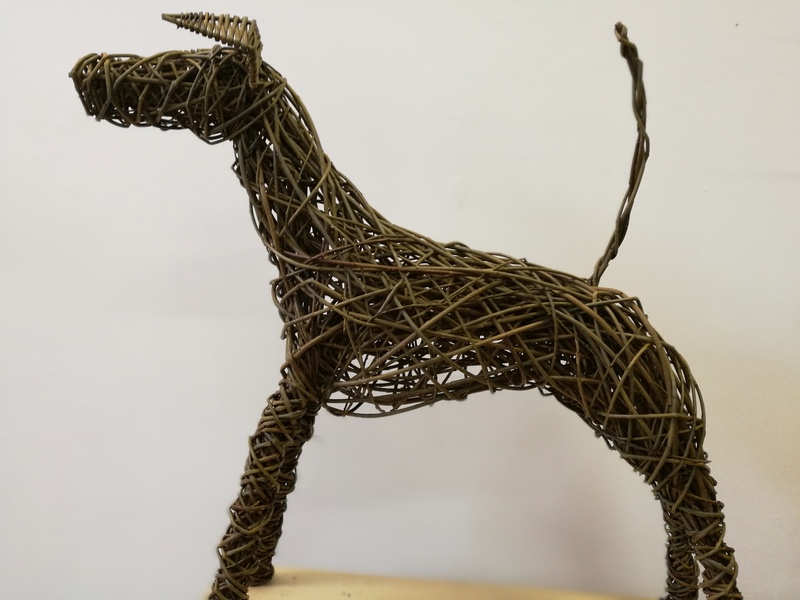 Weave your own quirky dog sculpture on this 1 day course. A Fox Terrier or maybe a Lurcher? 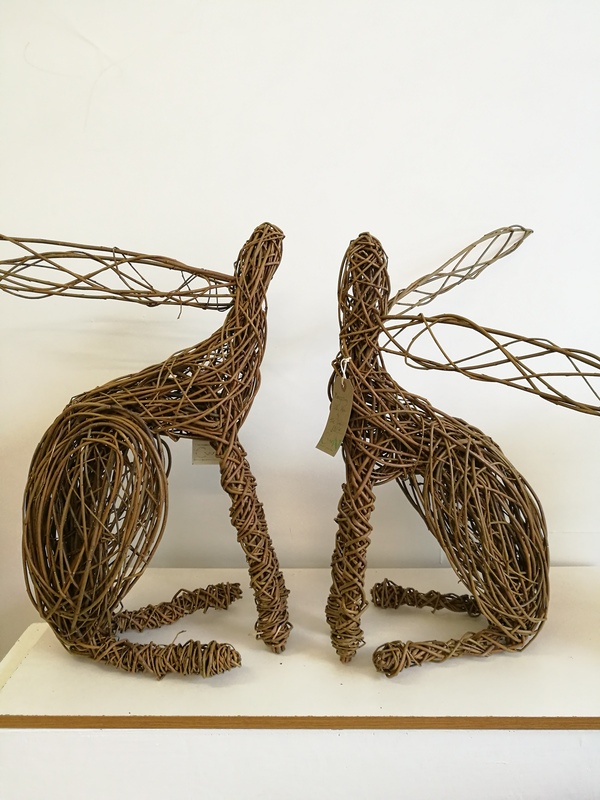 Work with willow artist Joe Gregory to weave your perfect pooch! Willow sculpture lends itself really well to birds. Weave a Heron, or a Chicken, a Goose or a Pheasant. 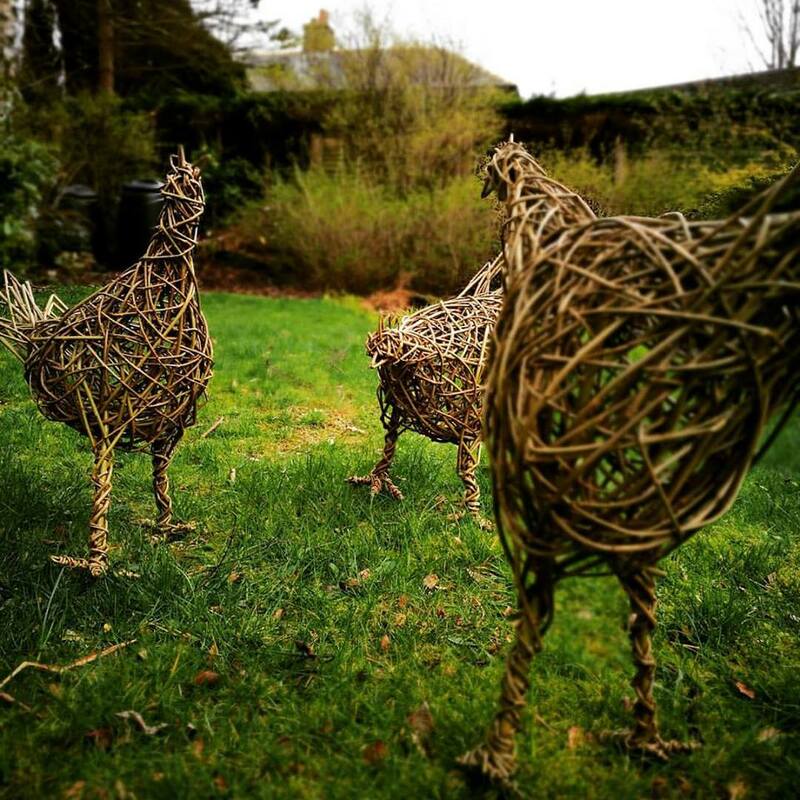 You choose on this 1 day course and take home a beautiful willow bird, ideal for the garden. These functional and very attractive log/kindling/storage baskets look great with their unique wooden handles. It also makes them easier to weave! So ideal for beginners and intermediates to learn on and great results are achieved. You can chose from a selection of wood at CWN or bring your own special piece. 1 Place left!! On this half day course learn basic weaving techniques to create 2 different bird feeders. Ideal for our small garden birds. including all materials, tools, beverages. Weave your very own pig sculpture on this one day course. Suitable for beginners and intermediates. You’ll learn sculptural weaving techniques that can be adapted to most 4 legged animals. Joe Gregory’s most popular sculpture course! 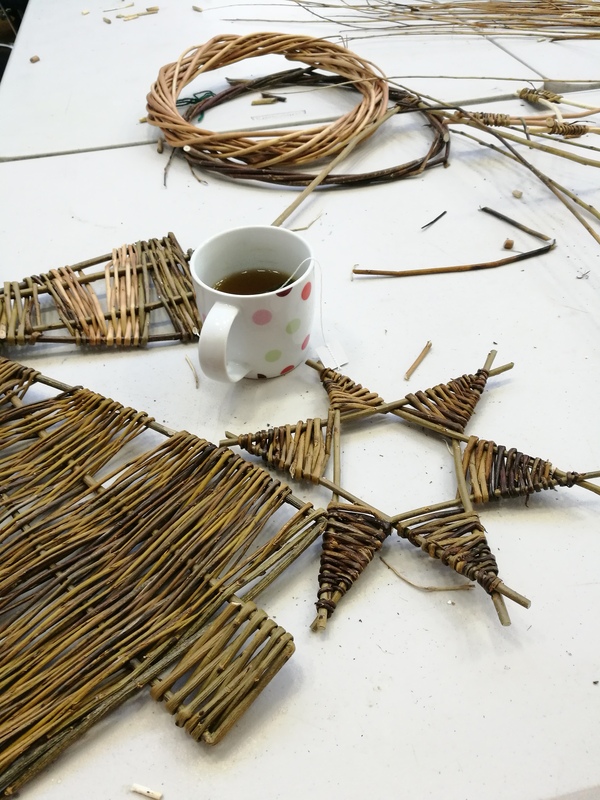 Weave your own Willow Hare, sitting, leaping, it’s up to you! Learn simple sculpture techniques to create a unique sculpture that has wonderful movement and form. Learn basket weaving techniques to create your own strong round willow basket. Ideal for a log or laundry basket. 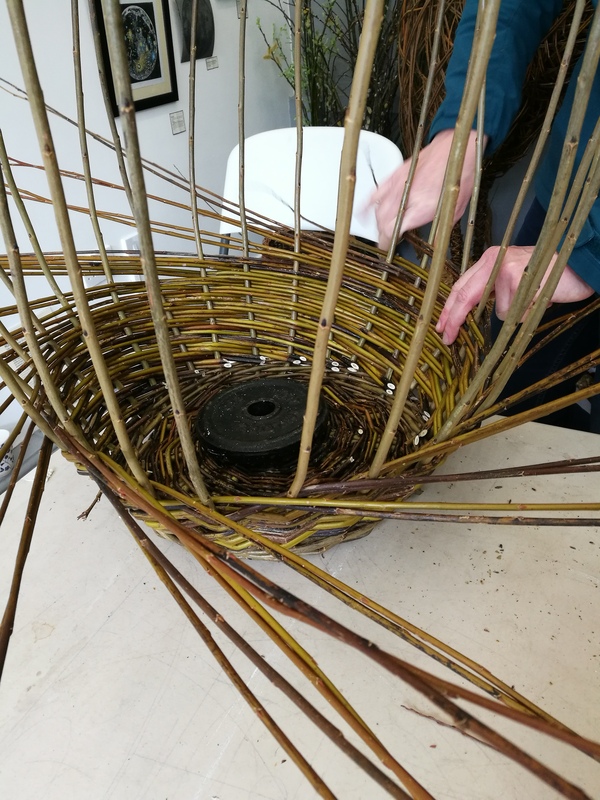 This course is suitable for beginners wanting to get really stuck into basketry and for those who have made baskets before this course can be adapted to your learning and ability. I only have 6 max on these courses so i can make sure each student gets a lot of my time. Suitable for beginners and intermediates, over the day you’ll learn basic sculpture techniques to create your own unique Trophy Stag Head. They look fantastic on any wall! Suitable for beginners and intermediates. I ran this course for the first time last year and it proved very popular! Over the day you’ll have time to weave a range of different stars and other Xmas woven gems perfect to decorate your own home or as presents for family and friends. My most popular Christmas Weaving Course! Over the day weave your own gorgeous quirky Reindeer. This course is suitable for beginners and intermediates, you’ll learn sculpture techniques and these beauties can live in the home or garden. My most popular Christmas Weaving Course! Over the day weave your own gorgeous quirky Reindeer. This course is suitable for beginners and intermediates, you’ll learn sculpture techniques and these beauties can live in the home or garden. 3 Places Left!! Creative With Nature offer fantastic courses in lovely Todmorden. The studio space is really lovely and has often changing exhibitions with work for sale at really tempting prices. Joe, the workshop leader, is friendly and attentive. I’d recommend just popping in if you’re passing to look at examples of what you could go on a course to make. Had a fab day at Joe’s Trophy Stag Head workshop, she is a very patient lovely lady who explains everything so well that any novice can understand. Had a really great fun day out and came home with a lovely stag head for the home. Thank you Joe!! 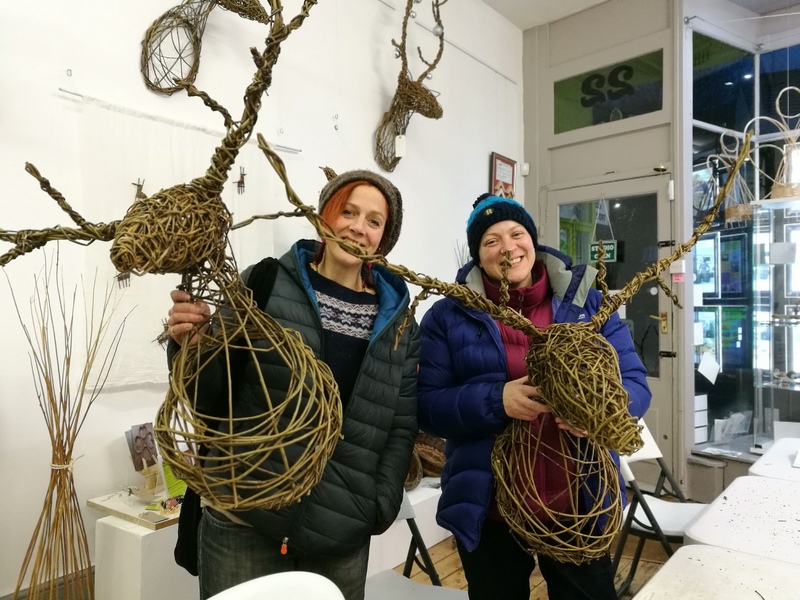 I had a fabulous day making a willow reindeer. Jo is a great tutor – very patient and helpful. I was amazed that I was able to produce something so wonderful in a relatively short day. It’s been much admired and will look beautiful with a few Christmas lights on. 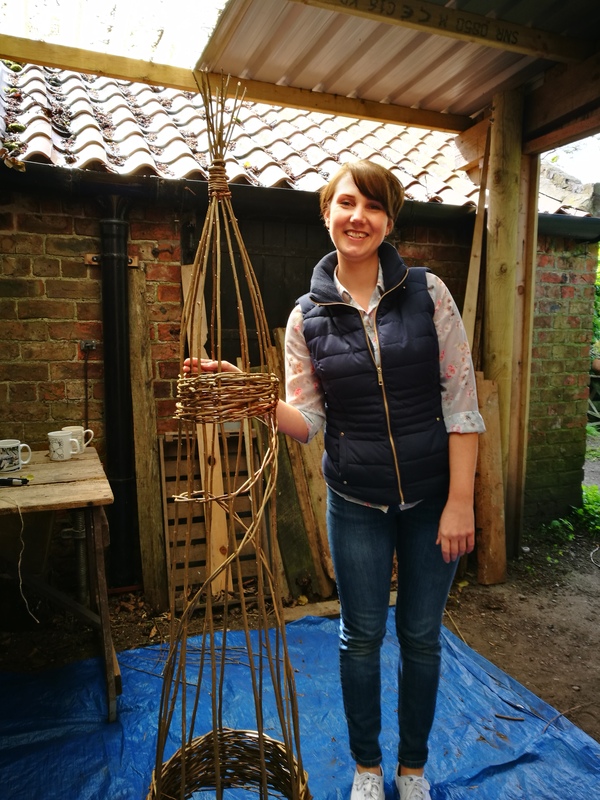 I thoroughly recommend Creative with Nature and look forward to a chance to make another willow structure for the home or garden. Thanks again Jo – great day. 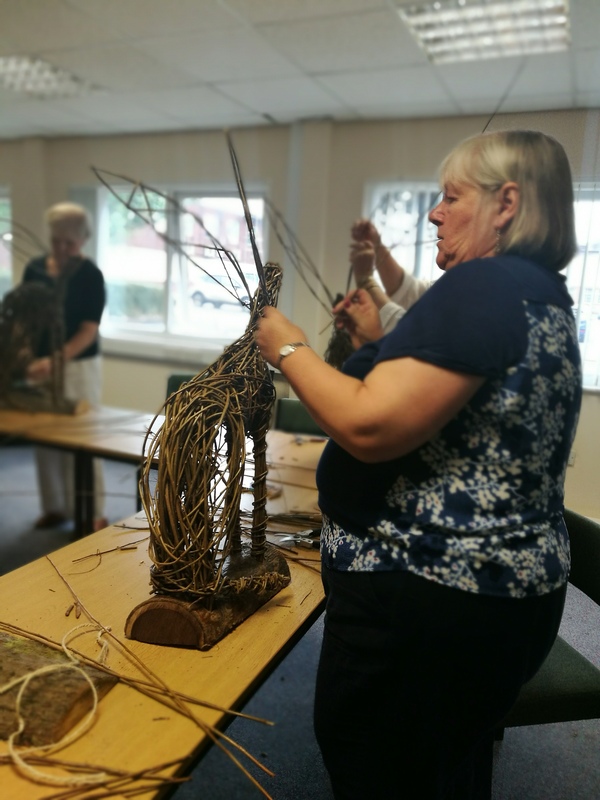 Joe ran a workshop for our local WI group, making woven willow hearts. 12 of us joined in and we were amazed could create the heart in the time allocated. Joe is a great tutor, relaxed and easy going and we’d happily rcommend her workshops. I attended a 3 hour course today and it was great. Weaving is something I’ve always wanted to have a go at and this short afternoon gave me a chance to produce a couple of small items like a star and wreath. Patient teacher, small class, reasonable price! What else – lovely area! I did a 1 day frame basket course in September with friends Lynne and Christine. Since then I’ve been hooked on willow, did a bit of research on the internet etc. and have begun working on sculptural forms. Just wanted to say that, thanks to Joe, I’ve now had a piece selected for the Beveley Art Gallery Open Exhibition! 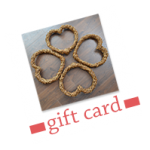 Gift cards make a great presents for Birthdays, Christmas or a thank you’s. 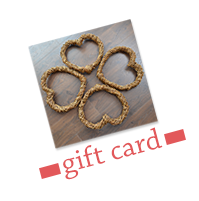 Put a gift card towards courses and weaving days. Available at the Creative with Nature shop/studio or contact us for details.